The Internet of Things (IoT) will undoubtedly continue to make headlines with the issue of security becoming more prevalent. Connected home security systems offer a myriad of features including door and window sensors, motion detectors, video cameras, and recording mechanisms -- all connected via the cloud to a mobile device or the Web. The intent of these systems is to provide security and remote monitoring to a homeowner, but the owner of the home security system may not be the only one monitoring the home. These capabilities come with risks and it’s in everyone’s best interest to understand those risks before activating these systems. Following up on the 2014 Internet of Things research study, Hewlett Packard Enterprise reviewed the security of the top 10 most common IoT devices. 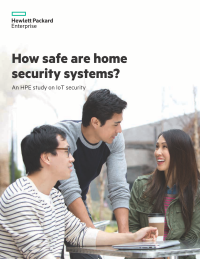 Download this paper to explore the security of some of the newest, connected home security systems and if these devices actually make our homes safer or put them more at risk.